Israel's misunderstanding of eschatology eventually destroyed her by leading her to reject the Messiah and the coming of the Kingdom of Heaven. Likewise, false eschatological speculation is destroying the church today, by leading her to neglect her Christian calling and to set forth false expectations. In this volume, edited by Kenneth L. Gentry, Jr., the reader is presented with a blend of Biblical exegesis of key Scripture passages, theological reflection on important doctrinal issues, and practical application for faithful Christian living. 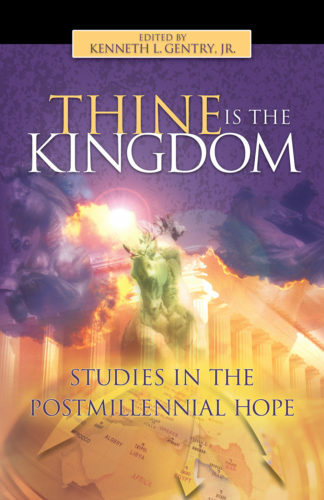 Thine is the Kingdom lays the scriptural foundation for a Biblically-based, hope-filled postmillennial eschatology, while showing what it means to be postmillennial in the real world. The book is both an introduction to and defense of the eschatology of victory. Chapters include contemporary writers Keith A. Mathison, William O. Einwechter, and Kenneth L. Gentry, Jr., as well as chapters by giants of the faith Benjamin B. Warfield and J.A. Alexander. This work should prove immensely helpful for understanding and defending the postmillennial hope. It should also enliven our prayer to God as we faithfully pray: "Thy kingdom come. Thy will be done on earth as it is in heaven... For [T]hine is the kingdom, and the power, and the glory, forever. Amen." Kenneth L. Gentry, Jr., holds degrees from Tennessee Temple University (B.A. ), Reformed Theological Seminary (M. Div. ), and Whitefield Theological Seminary (Th. M.; Th. D). He also attended Grace Theological Seminary for two years. He is Research Professor in New Testament (Whitefield Theological Seminary), a theological writer, and conference speaker. He has written numerous books and articles on issues such as theology, ecclesiology, eschatology, theonomy, six-day creation, presuppositionalism, worldview, Christian education, and more. He also offers a Christian writing correspondence course. He is the Director of GoodBirth Ministries, a non-profit religious educational ministry committed to sponsoring, subsidizing, and advancing serious Christian scholarship and education. He is a retired Presbyterian minister holding his ordination vows in the Reformed Presbyterian Church, General Assembly. → More by Kenneth L. Gentry, Jr., Th.D.